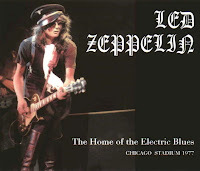 The first show of the band's four night stand at Chicago Stadium begins with a series of loud firecracker blasts as the band takes the stage. Plant is quick to respond, saying "listen, before we start, can I ask you one thing?... can you stop throwin' those firecrackers, cause we wanna give you a lotta music and we're not gonna fight with firecrackers, okay?" The Song Remains the Same is a relentless sonic assault. Plant again asks the crowd to cool it following Sick Again. Page tears through a blistering guitar solo during Nobody's Fault But Mine. In My Time of Dying is plagued by tape issues. Since I've Been Loving You is an intense emotional journey. Page shreds wildly through the guitar solo, emphasizing each note as if it were his last. An outstanding performance. Jones is introduced as "the most debonaire member of the band" before No Quarter. He and Bonzo further develop the honky tonk interlude during the piano solo. Page delivers an excellent guitar solo. Unfortunately, a cut in the tape near the end leaves us at the return to the main theme. There is another cut during the final verse. Plant announces "at the front of the stage for the first time, John Bonham... looking very suave in a two-piece tuxedo" before The Battle of Evermore. Going to California is introduced as "a tribute to a lady who sings and drives a Mercedes and gets uptight." Unfortunately, the song is plagued by more tape issues. After singing a bit of Surrender as Page retunes before Black Country Woman, Plant jokingly refers to the Black Country as "the land where men are men and sheep are nervous," to which Page responds "better to live one day as a king than a thousand days as a peasant." Page's guitar is painfully out of tune during White Summer/Black Mountain Side. He spends most of the song trying to compensate for the problem, but to no avail. Plant delivers a powerful performance during Kashmir. His banshee howls threaten to destroy the taper's equipment. Bonzo is introduced as "our diplomat for peace and good relations" before Over the Top. Unfortunately, the tape suffers from constant volume fluctuations throughout the drum solo. Page has trouble keeping up during Achilles Last Stand. The first few notes of Stairway to Heaven are met with a loud cheer from the crowd. Page's fingers become entangled in the strings during the guitar solo. The band closes the show with Trampled Underfoot, with Page shredding through an aggressive guitar solo. The tape is distant and quite noisy with tape disturbances of varying severity throughout.